Student Chapter for the Society for Biomaterials! Plan on joining us on October 3, 2014 for our Second Annual USD Biomaterials Day! Dr. Thomas J. Webster, Chair and Professor of Chemical Engineering at Northeastern University will be our Keynote Speaker for this event! The title of his topic is: Transitioning from Nano- to Pico-Technology: Toxicity, Infection, and Tissue Growth. Please join us for this great event! Lunch is provided and registration is free! For more information about USD Biomaterials Day, follow this link: Biomaterials Day 2014. The USD chapter of SFB participated at Sanford's 3rd "It's All About Science!" Festival in Sioux Falls, SD. We engaged the community in fun hands-on experiments including a dry-ice soap bubble experiment, lava lamp, strawberry DNA extraction and ferrofluid show. The USD chapter of SFB participated at Sanford's second "It's All About Science!" Festival in Sioux Falls, SD. Members engaged the community in fun hands-on experiments including a dry-ice soap bubble experiment, color blind tests and a strawberry DNA extraction activity. We had a great time! The University of South Dakota Student Chapter of the Society for Biomaterials was awarded a $5,000 grant from the national Society for Biomaterials to host a Biomaterials Day. This day-long conference took place on May 8, 2013 at the University Center, Sioux Falls, SD. We had several speakers from Academia, Research and Industry. Congratulations to the winners of the Poster Competition: 1st Place: Berit Foss, 2nd Place: Sujan Lamichhane, 3rd Place: Annemarie Gallo. Thank you everyone who participated and made our USD Biomaterials Day a success! Congratulations to Annemarie Gallo and Sujan Lamichhane, recipients of STAR (Student Travel Achievement Recognition) awards from the Society For Biomaterials for the 2013 Annual Meeting in Boston. Both students work with Dr. Gopinath Mani, Assistant Professor of Biomedical Engineering at the GEAR Center in Sioux Falls. A link to USD's press release can be found by clicking here. 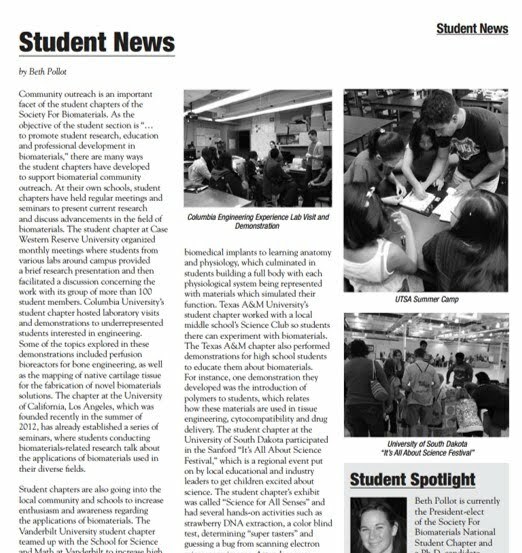 Look on page 14 of the Biomaterials Forum to see Beth Pollot's Student News article on SFB student chapters community outreach. Read about our chapter's volunteer work at Sanford's "It's All About Science Festival" and notice a picture with some familiar faces! A link to the Biomaterials Forum can be found by clicking here. We are on page 14! The USD chapter of SFB participated in the Sanford "It's All About Science!" festival in Sioux Falls, SD. We encouraged students, children, and adults in the community to get interested in science with a DNA extraction activity, a colorblind test, a "super-taster" taste test, as well as displays of current research being done at our Biomedical Engineering Graduate Program. The USD chapter of SFB received a travel award of $1,667.00 from the Society for Biomaterials. In combination with donations from the USD Biomedical Engineering Program and our faculty sponsor, Dr. Gopinath Mani, our chapter was able to send a student to attend the 9th World Biomaterials Congress in Chengdu, China.